My daughter is 9 this year, and continues to be obsessed with My Little Pony. Once again, she has chosen a MLP character for her Hallowe'en costume. Not surprising, really. I mean, what little girl doesn't want to dress up as pony? Cute ears, wings, cutie mark. And with the introduction of the Equestria Girls, all sorts of glittery fashions! 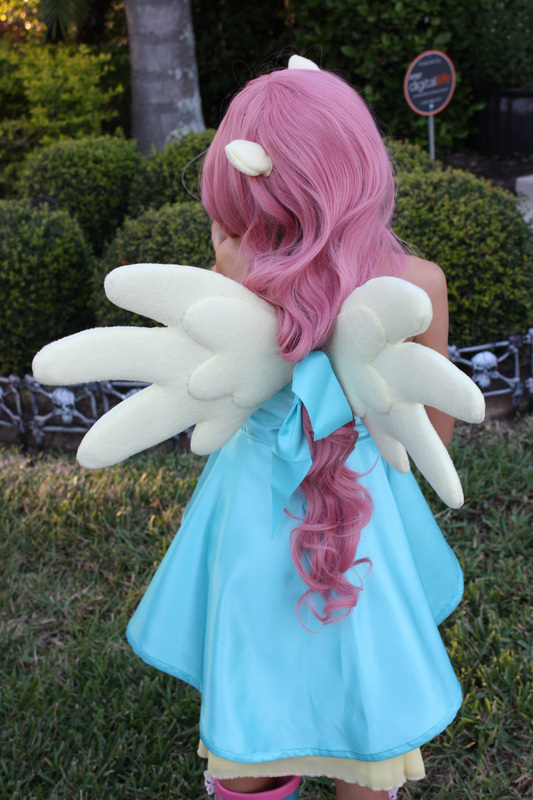 This year's choice is Fluttershy. 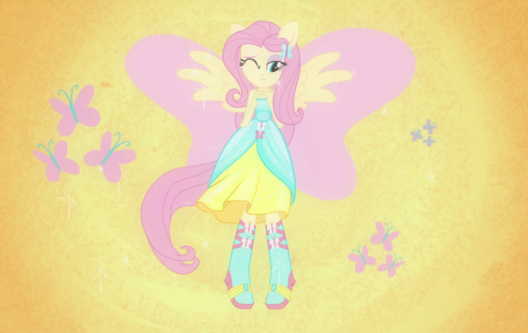 She's chosen the dance gown outfit from the Equestria Girls movie, and wants to include the ears and wings during the "transform" moment. The big pink wings are just butterfly accents in the background for this image. She just has her pony wings for the outfit. Amazon is a great place to find odd wigs for costumes. I found a long pink wig with gentle curls that should work perfectly. So the next step is a visit to the fabric store (my favorite part!). We found a lovely satin for the over-dress portion. I'm debating finding a sheer fabric with some glitter to layer over top, but for now we'll stick with the shiny satin. 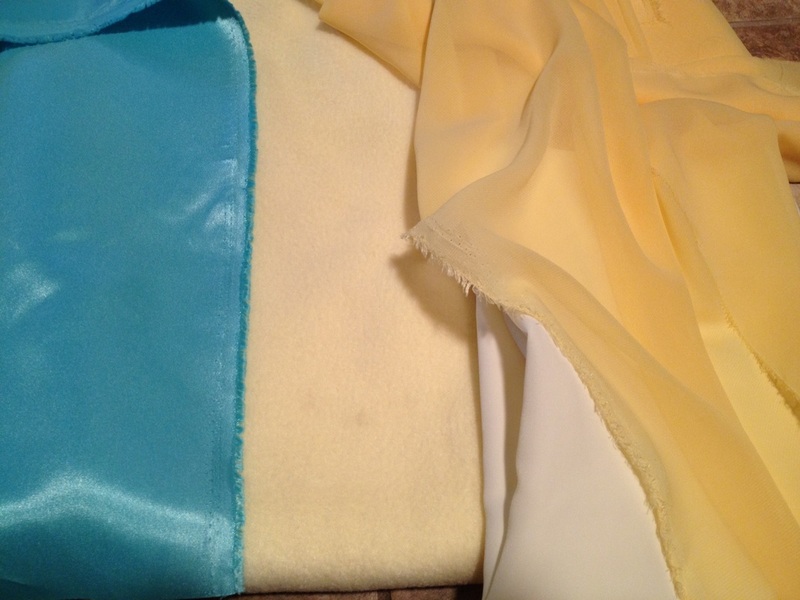 A buttery cream rayon-like fabric for the skirt that is lightweight and has amazing flow, and a yellow sheer to put on top of it for a layered skirt that she can wear after she's done with the costume. 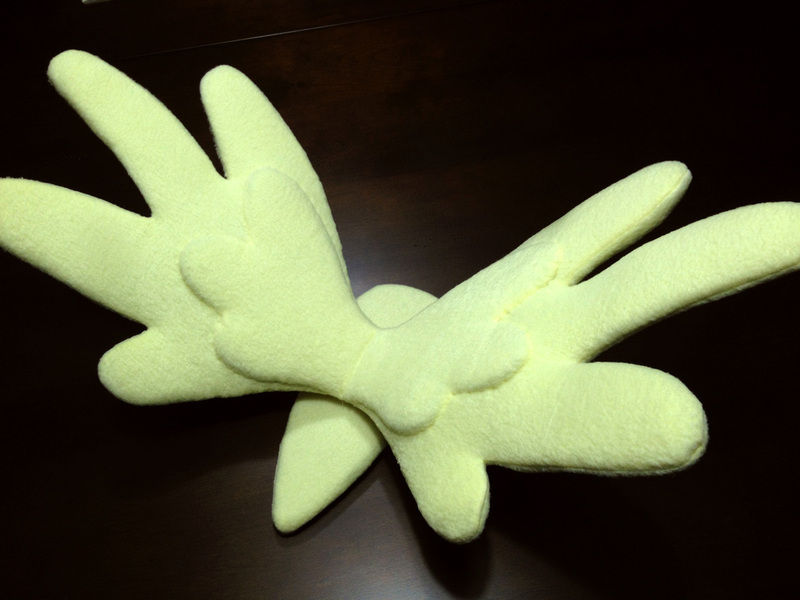 And some yellow fleece to cover the wings and make the ears with. 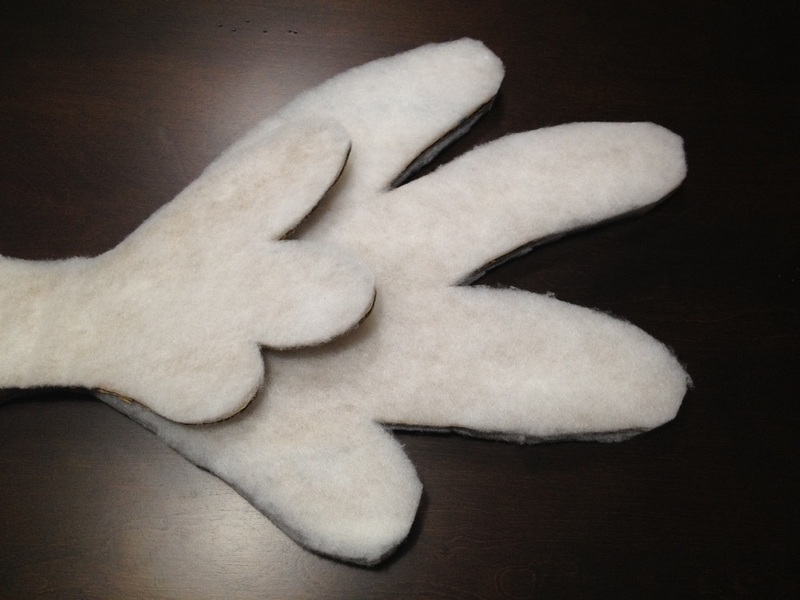 For the wings, we're going with a plush look (thus the fleece fabric). First I need a base to hold their shape. I'm using cardboard because it's cheap, easy, and lightweight. I'm planning to put the smaller wing set on the back, rather than the front. Especially with the wig in place, no one is going to see the smaller layer if I put it in front, and this gives more interesting detail to be seen from the back. Using white craft glue, I glued quilter's cotton batting to both sides of the big wings, and to one side of the smaller wings. Then trimmed off the excess to keep my shape. I used the cardboard as a template to trace my shapes onto the fleece with a gel pen. The gel pen is ideal because it doesn't catch as badly on the fabric as most markers, and doesn't seep through the thick fleece. Then I pinned and cut out my fabric, being sure to leave a seam allowance around the edge. 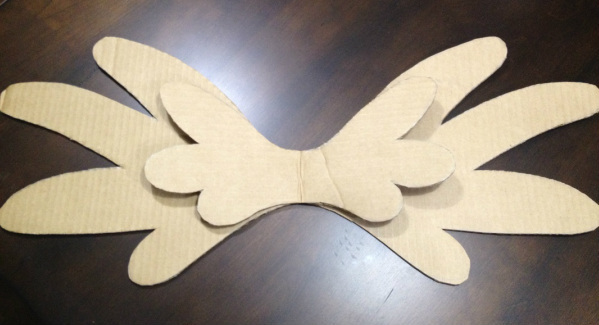 Sew along the trace lines, leaving the center section of each set of wings open at the top and the bottom, allowing the wings to be flipped right-side-out and the cardboard pieces to be stuffed in. Then hand-stitch the open sections closed. I then made a wedge out of rolled up cardboard covered in more fleece to force the wings back, and a base to stabilize everything on. 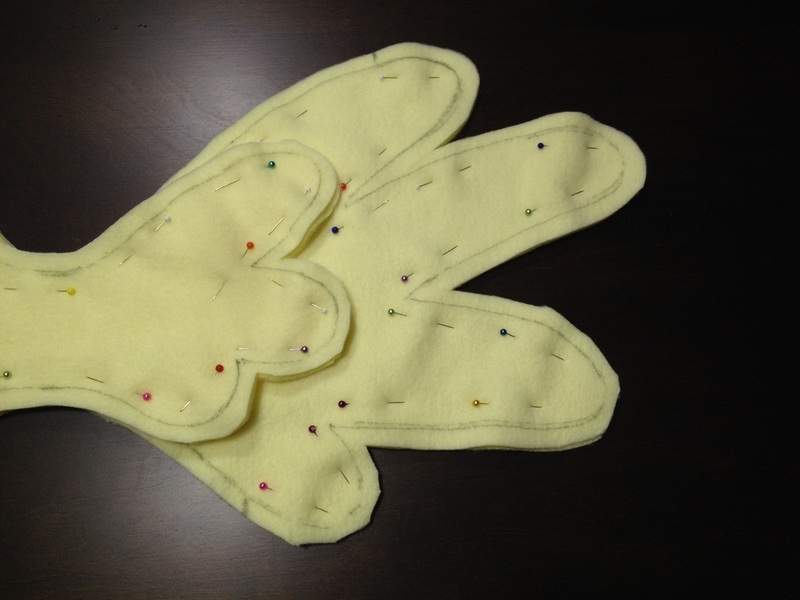 More hand-stitching to attach all the pieces and sew the mini-wings onto the main. All that's left now is to attach the straps so she can wear them. Now for the boots. I started with a pair of Hello Kitty rain boots that we had in the closet. I cut the handles off of the top, and then cut pieces of 2mm craft foam to cover the boots. This also gave me the opportunity to add height to the boots. 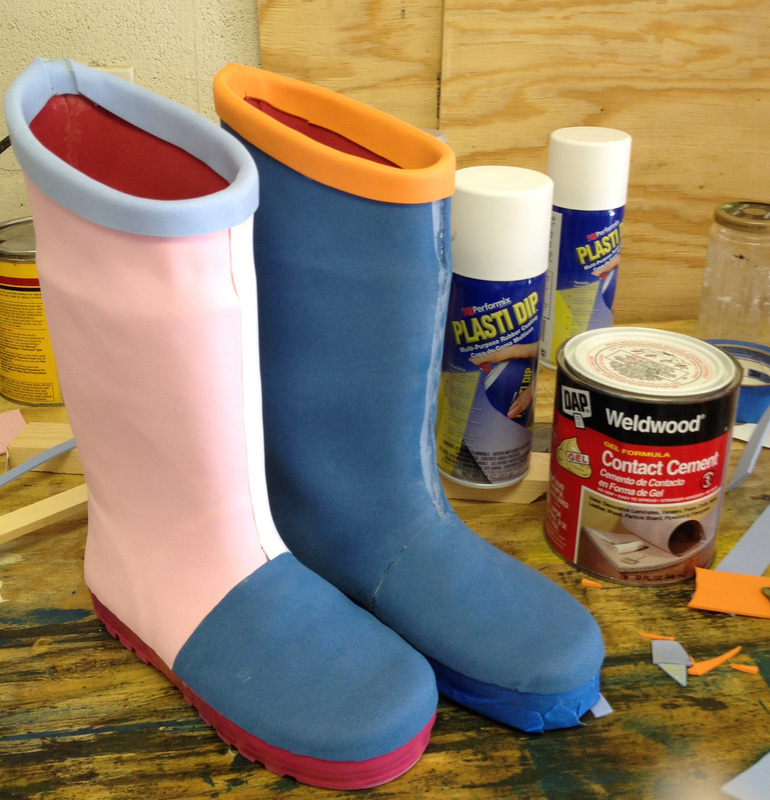 I masked off the pink base of the boots and sprayed them with a couple of layers of Plasti-Dip, a liquid rubber spray. This helps close the pores in the foam so they don't soak up the spray paint. I applied a layer of primer after the Plasti-Dip had cured, and then spray paint once that was dry. I did this for all of the ribbon pieces that I had cut from foam as well. Then I used the contact cement to attach the ribbon pieces, and sprayed the boots down with sealer. The butterflies are metal "buttons" that I found a Joann's. I bent their wings forward and painted them, then glued and sewed them to the boots. The blue crystals were also from the craft store. I don't have progress shots of sewing the dress. I sew pretty quickly and don't really stop until I'm done. The skirt is a simple 4-panel design with an elastic waistband that she can wear as part of her normal wardrobe after Halloween. It turned out light and airy, just as I imagined it. The blue satin dress doubles as wing support. When fully assembled, we had an ecstatic little girl dancing through the house, let me tell you.